As my first post, I’m adding slides from a workshop that Ryan Hill from ARTLAB+ at the Hirshhorn and I did at the Digital Media and Learning conference this year. Ryan and I are both working to develop YOUmedia digital teen spaces at our respective institutions thanks to grants from the John D. and Catherine T. MacArthur Foundation. The title of the workshop was “HOMAGO for All: Applying HOMAGO Principles to Different Spaces”. In case you haven’t heard of HOMAGO it’s an abbreviation for “hanging out, messing around, and geeking out” -which are three levels of participation that Mimi Ito et al identified in this book. The HOMAGO principles are very influential for the YOUmedia sites. In our presentation we talked about five design constraints that we have had to deal with often during the development of our sites and spaces. These include: audience, physical space, type of institution, time, and content area. Recreating a YOUmedia space with four activity centers set up where conference participants could hang out and mess around. The four spaces were: 1. Game Design with Scratch – participants followed self-guided instructions (with nearby assistance from a Mentor) to learn how to make a simple maze game using the program Scratch, 2. GIF-o-matic – participants completed the phrase “Digital Learning is _____” and then created a GIF using the app GIF+, 3. 3D Imaging – participants used the app 123D Catch to take pictures and render a 3D image of another person and 4. GarageBand Basics – participants recorded their own soundtrack to 45-second time-lapse clips of events in nature and space using the program GarageBand. 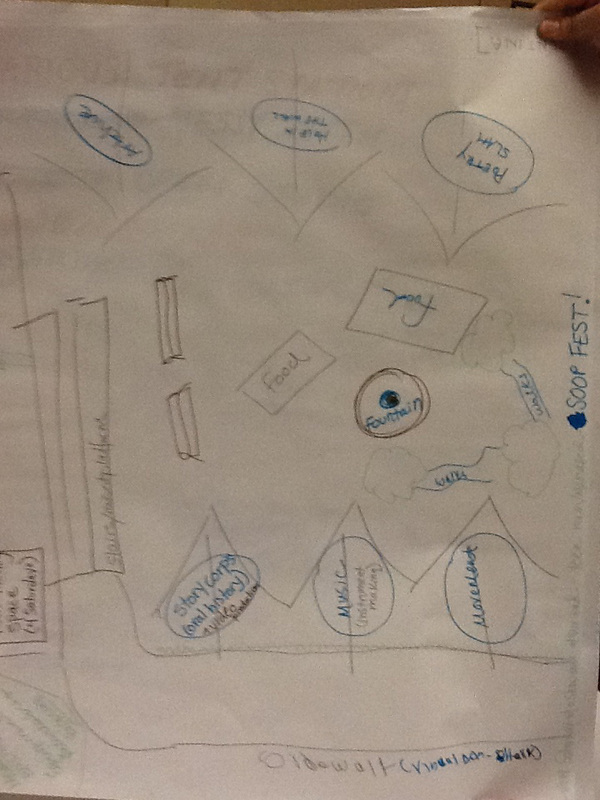 An activity in which our workshop attendees were asked to work in groups to design a fictitious YOUmedia space. Each group was randomly given 5 different design constraints and then asked to think about how each of those design constraints would shape their site. For example, one group might have recieved the following constraints: audience – tweens, space – one 500 sq ft room, type of institution – hospital, content area – STEM, and time – Saturdays. Then they had to give a two minute presentation about their site. Some groups drew, some acted, and one even made a short video! We were so impressed with the thought and effort our workshop participants put into imagining HOMAGO principles in new spaces! While it’s not the same as being there, I hope some of this information can be a resource for the Digital Is community. Feel free to contact me if you have any questions!